Manufacturer of a wide range of products which include sandstone gazebo, stone gazebo, modern stone gazebo, stone garden gazebo, stone baradari and outdoor stone gazebo. 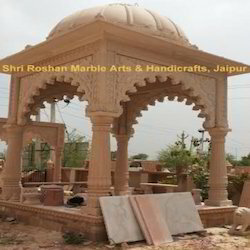 Running with an aim to accomplish the requirements of the clients, we are engaged in offering Sandstone Gazebo. 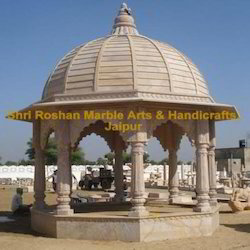 Offered sandstone gazebo is available in a variety of sizes and customized options as per the need of customers. 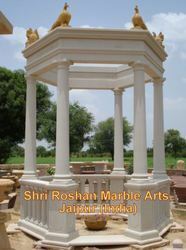 This sandstone gazebo is crafted from high grade stone & modern tools keeping in mind the market trends. This sandstone gazebo is checked on various quality parameters before being dispatched to our customers in order to ensure optimum standards of quality. 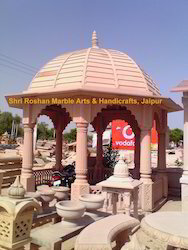 We are the well known manufacturer, exporter, wholesaler, trader, retailer and supplier of enhanced quality Stone Gazebo. Our stone gazebo is praised in the market due to its best finishing & attractive designs. This stone gazebo is crafted by utilizing utmost quality stone by our experienced craftsmen. Offered stone gazebo is comes in different designs, sizes and other customized options so as to meet the demand of customers. This beautiful and stunning Modern Stone Gazebo Is designed by our team of workers to increase the beauty of your Gardens. Simple design yet stylish and is the reason why we are the trusted the most among all. Being a quality driven organization, we have carved a niche for ourselves in this domain by offering Stone Garden Gazebo. The given garden gazebo is intricately crafted by our innovative craftsmen by making use of best quality stone & it’s shaping tools in compliance with the market trends. Offered garden gazebo can be customized as per the specific needs of customers in a given time frame. Customers can easily avail this garden gazebo from us at affordable rates. Leveraging to our vast experience in this domain, we are able to present a beautiful array of Stone Baradari. The given stone baradari is crafted from the top grade stone & contemporary tools as per the set trends of market. Offered stone baradari is accessible in a number of sizes, finishes and customized options so as to fulfill the needs of customers. This stone baradari is checked in terms of quality for ensuring its flawlessness. Stone Gazebos are very widely used in lawns, resorts etc to give them a heritage and attractive look. This Outdoor Stone Gazebo does the same as well. 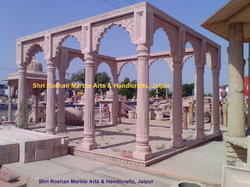 Made with Pink Sandstone by our skilled workers this Outdoor Stone Gazebo looks very beautiful in lawns etc. The 8 pillar design with Jali in bottom portion makes it very artistic. Looking for Stone Gazebos ?